Indian rotis. Indian roti collection. different rotis across India. There was a time in India, when if a young woman could perfectly puff a roti, she would be an ideal daughter-in-law material. The times have changed now and we have pre-cooked rotis available in market. But, lets get to know about the most integral accompaniment of an Indian kitchen – roti. Roti is a term used to describe flatbreads, which are used to eat vegetables, gravies, etc . The term ‘Roti’ is specifically used to address flatbread made using wheat flour (Atta). India being a diverse country, each state has their own variation depending upon the local ingredients. Roti can be rolled to a range of thickness. Thick roti , commonly known as parantha are made using flour and stuffing (aloo, paneer, gobi etc). Thin, soft ones are called chapatti and the smallest fluffy flatbreads are called phulka. When we deep fry small disc in hot oil, it is called puri. Roti is rolled on a wooden elevated board called the chakla and the rolling pin is called belan. A pair of tongs help in easy flipping of the roti. They are generally cooked on a stove top using a flat pan, but when they are cooked in a clay oven , it is called as a tandoor. A variant of roti made using refined flour (Maida) is called as naan. The same maida dough when deep fried is known as bhatura. Roti is found in abundance in every Indian kitchen and generally preferred in at least one meal. Here are some recipes with a variety of flour and millets. Gujarati roti recipes. The most common of all roti's in a Gujarati household is the phulka or lovingly called as Rotli in Gujarati. Traditionally rotlis are cooked on a tava and later put on direct flame for it to rise and puff. A drizzle of ghee or oil is the finishing touch given to this light on stomach flatbread. Another popular Gujarati flatbread that reminds me of my nani is the Padvali roti which is made by layering two thin rotis together. Summer is here, it is time to savor on some aam ras and nothing accompanies better than the Gujarati Padvali roti. Similarly, Winters are incomplete without a thick bajra rotla along with some fresh white butter and jaggery The rotla can be served with baingan bharta to make it a full meal. Another popular creation is the Satpadi roti which is made using seven grains and an assortment of spices. Maharashtrian roti recipes. During one of my visit to Konkan beaches like Harihareshwar and Diveagar, I came across Maharashtrian Ghavan. Ghavan is a thick, spongy pancake similar to neer dosa made using rice flour. It is generally served with coconut chutney as breakfast. Maharashtra's go to breakfast is thalipeeth which is an iron rich flatbread made using multiple flours. Serve along with some spicy thecha and curd. Also, you can enhance them with an addition of vegetables to make variants of it. Sabudana thalipeeth, rava thalipeeth, methi thalipeeth are some other famous Maharashtrian flatbreads. There is a large collection of Bhakri and Rotis to choose from. You have the healthy Jowar Bhakri and Whole Wheat Bhakri to rice bread like Chawal Bhakri , which Maharashtrian’s have for lunch or dinner. North Indian rotis. Winters in the Northern region are celebrated with piping hot Makke di roti and sarsoon da saag. Also, the day begins with sumptuous stuffed parathas. Aloo, gobhi and mooli are widely used to perk up simple roti doughs. Radish is found abundantly in the northern region of India. They make Mooli roti, parantha using them which keeps them warm in cooler climate. Relish them with aam ka aachar. Gulp down these pareparations with tall glasses of lassi. Khamiri Roti is the Mughals closest answer to leavened bread. Khamir, which means yeast, is used to prepare this roti, thus making it thick and spongy. Khamiri roti taste great with nearly any subzi and can even eaten with just some butter. A traditional bread from the imperial Mughal times, this Mughlai roti recipe features a plain flour roti aesthetically flavoured with aniseeds powder. Rajasthani rotis. 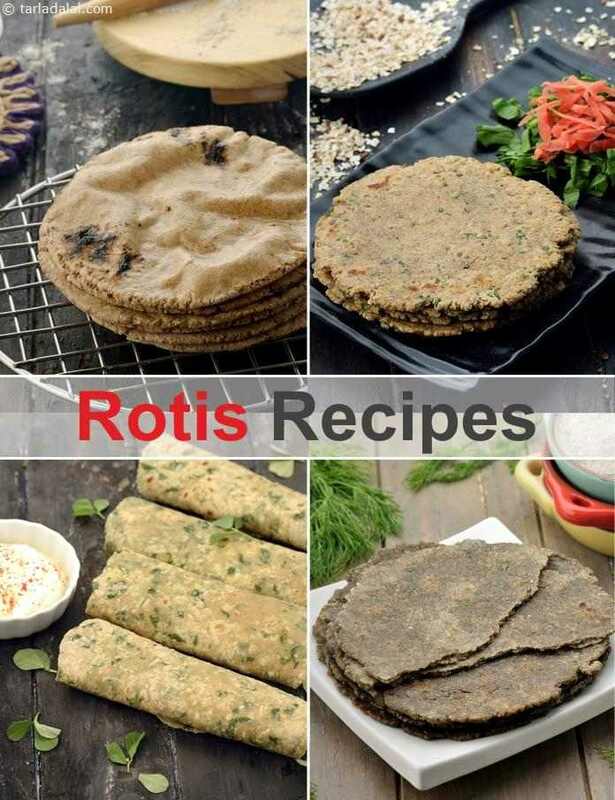 Our Rajashtani rotis constists of rotis made from bajra, whole wheat flour, maize flour, beasn. Bajra grows in large part of arid parts in Rajasthan, Bajra rotis are relished all over the state. Thickly rolled Bajra Roti are cooked over "kanda" (cow dung cakes) in the villages. Misi roti is another traditional Rajasthani flatbread made using different flours and condiments. Rajashtani khoba roti made from whole wheat flour, where the word 'khoba' means indentation or cavity and that is how these rotis are prepared. They are best cooked in a gas tandoor but an ordinary Tava (griddle) over gas will give you equally good results, if cooked over a slow flame. Serve this roti hot, smeared with ghee. Unleavened rotis of wheat and maize flour, Tikkar Rajashtani roti is a mouth-watering delicacy from the dessert province of Rajasthan. Cooked with ghee, this crisp bread is wonderfully flavoured with ginger, garlic, onions, and more, which makes it enough to serve it with a simple accompaniment of curds and pickle. Jain roti recipes have been made specially for Jains as they have all kinds of restrictions in not having onions, garlic, carrots, radish, green leafy vegetables etc. Ideally, People who follow Jainism do not consume any root vegetables and many green leafy vegetables in the monsoons. Another type of roti is Thepla which is made by adding different masalas to the whole wheat dough and is cooked in oil to make it very soft. A very popular variant of Roti is Makhani Roti for the jains. Odia Rotis, Did you know that Odia eat more rice than rotis? Odias love their rice. Rice is consumed all across the state in different forms like Khechuri, palou, pakhala bhata, kanika, etc. Traditional Odia meals do not have Rotisor Parathas but have savoury or mildly sweet Pithas like chakuli pitha(similar to dosa but slightly thicker), enduri pitha, Chitau pitha (similar to neer dosa), etc. Janta roti (which translates to pre-cooked roti) is a soft roti make of whole wheat flour. The flour is first cooked in milk or water (similar to the process of making choux pastry) which makes the rotisso soft that they melt in your mouth. This roti, though not consumed in all parts of Odisha is a favorite amongst kids. In the past few decades, globalization has changed different aspects of the Odia culture including food habits. In the globalized and cosmopolitanized Odia households, people relish breads like soft and fluffy burger buns, yeast –leavened dinner rolls , store-bought pretzels or bagels , different types of parathas, puris, luchis etc. Enjoy our Indian rotis, Indian roti collection, different rotis across India and other Indian bread articles below. Colourful and nutritious, these carrot and coriander infused rotis made of rice flour and soya flour make a perfect mini meal with a bowl of curds and khichdi.